A year ago last January I had to undergo a very serious operation on my right eye and was told to keep my head down for at least 10 days. I managed 14, but what does someone who’s used to working every day of the week but Sundays do for all that time? Out came the clipboard and the manuscript--there was, in retrospect, never any question of what I would work on during my convalescence. You see, The Hunting Ground has been with me ever since 1990, and has been through at least six or seven revisions during those years. It’s the book I first worked on after my thriller The Alice Factor was finally set to be published in 1991. Which was before I started writing Mayhem (1992), the opening number in my Jean-Louis St-Cyr/Hermann Kohler mystery series. Head down, pencil in hand--for I always compose my stories in longhand and have for the past 43 years of full-time writing--I started in. And yes, I always use one of those rechargeable pencils: HB 0.5mm leads and no others. That first day, I worked for 12 hours straight and totally forgot myself. Immediately, it all came back, all those doors that had opened in my imagination, opening again and again into Occupied France during the Second World War. Those 14 recovery days eventually stretched into six months of work on The Hunting Ground. And certainly, when I retyped the manuscript later on, I could have used both eyes, had they been working in sync and in focus. However, the operation was a terrific success and I am extremely lucky to have come through it so well. Always I am drawn into the story I’m telling and that, in itself, can be a very powerful thing. And of course, once done, one has to stand back and look at it all from a distance. Sure, some things you might not see even then, simply because you’ve been so close to the work for such a long time. But Lily, as the first-person narrator of this yarn, had--and still has--a lot of meaning for me because, in essence, she spoke of what was happening to so many others. Lots and lots of people just like her hoped never to be drawn into such a war or made victims of that war’s violence, and yet they were. Lily comes to see and live with the very changes war visits upon her, a mother with two children. She also introduced me to the German occupation of France (1940-1944) and allowed me to open door after door into what is a truly remarkable period of history. And certainly, when I was working again on this novel last year, with a far greater understanding of the history than I had back in 1990, I could have included and dealt with other aspects I’ve come to understand since then. But I didn’t; I wanted the story to be as close as possible to the way I’d written it originally. Becoming an active résistante, Lily goes on to work with Tommy and others in the search for and recovery of stolen works of art. However, she’s ultimately arrested and sent to the German concentration camps at Birkenau and then Bergen-Belsen, where the past and those recollections of Tommy and the others are all that really keep her going. Always, though, she blames herself for what happened. Finally freed in 1945, her recovery is uncertain. From a clinic in Zurich, Switzerland, she begins sending little black pasteboard coffins to her husband and his friends, and also to one other person, all of whom think her dead and themselves released from any responsibility for what has happened. Telephone calls follow in which Lily tells each of those people that, while they may have been cleared by the Résistance, she’s coming home and they are to meet her at the “château.” But time, which for her, in the concentration camps, has been spent entirely in a memory-packed past, increasingly confronts her with the present, until both are one and the same. To achieve her ends, she’ll have to employ all of the survival skills she learned from the Résistance, as her husband--together with his friends, a Sûreté detective inspector, Gaetan Dupuis, and a former SS Obersturmführer, Ernst Johann Schiller--pursue her in what was once the hunting ground of kings: namely, Fontainebleau Forest. The notion of writing a series attracted me. I knew, though, that if I were to tackle it properly, I had to keep on delivering new installments to bookstores. As a result, I set aside The Hunting Ground and concentrated on the wartime investigative adventures of St-Cyr and Kohler. Yet still, I found myself coming back repeatedly to the tense tale of Lily de St-Germain. 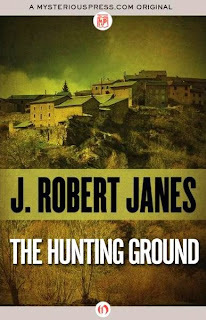 Finally, I had that eye operation and those six months of concentrated work on the novel, and it all led to the publication this week of The Hunting Ground--23 years after I started writing the novel. It’s only the first of two new books with my name on them. Tapestry, the 14th installment in my St-Cyr and Kohler series (following last year’s Bellringer), is due out from Mysterious Press/Open Road on June 4. And The Alice Factor is set to be released as an e-book, also from Mysterious Press/Open Road, on June 5. So in a sense, for me as well as for Lily, the past has become the present. Janes is absolutely brilliant at describing the mood and setting of Nazi-occupied France, plus his characters and plots appear to be totally authentic for those times. I can't wait to read The Hunting Ground.